Potatoes are one of the most versatile foods of the world. It can be mixed with almost any dishes and it won’t spoil the taste or nature of the food or dish. There are different ways of cooking potatoes, they can be boiled, fry, mash or even grill. They are many more methods; the current articles will guide you to boil potatoes in a good and easy way. Boiled potatoes are well suited for mashing and also making potato salad. There are some ingredients required to boil or cook potato as they are required for most of the dishes. The required ingredients are salt, water, pepper, potato (salt and pepper usage depends on the users). The equipments that are required are peeler, pot, brush. It is very important to buy fresh and new potatoes, as fresh potatoes are better suited to boiling. The fresh potatoes would have thinner skins leading to easy cooking or boiling. Some of the new or fresh potatoes would be in red color. Go for firm ones while purchasing as they are good for boiling. The potatoes must be cleaned before using them, rinse them in ordinary water, don’t ever use any soap. Clean the potatoes with the help of the vegetable brush, remove the damaged parts from the potatoes. Then select whether to peel the potatoes or not. In the case of you going to bake the potato after boiling them, better don’t peel them. While considering the case of mashing them, you got to peel them off, depending on the user’s choice. If you want to peel them use vegetable peeler or sharp knife. Once the peeling is finished, store the potatoes in cold water filled pot. This makes sure that they are fresh and well moisturized, and any discoloring can also be avoided. Then the process is to boil them. You can either use full potatoes or pieces of it, try to use similar pieces of potatoes. When the sizes vary a much, there would be some variations in boiling level too. Some part of the food would be half and the others will be fully cooked. 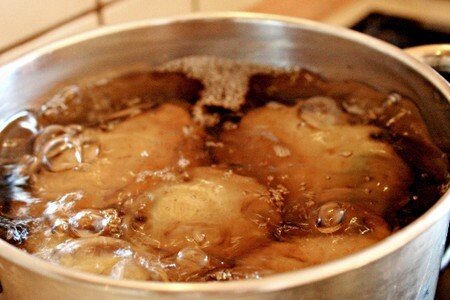 After placing the potatoes with cold water inside a cooking pot, add a spoon of salt (it’s only optional). Then ignite the stove or oven, cover the pot with plate to maintain the heat inside which ensures quick boiling of potatoes. As said earlier, the time required to boil the potatoes depend on the size of the potatoes and the level of heat applied to the pot by the stove or oven. Small potatoes will be boiled around 10 to 15 minutes while large ones will take around 20 to 30 minutes. To check whether the potatoes are well boiled, take a potato out and pierce it with a fork, with this you can find the boiled level of the potatoes.